Brady Hoke's Michigan tenure started fast, and now he has to reverse a negative trend. 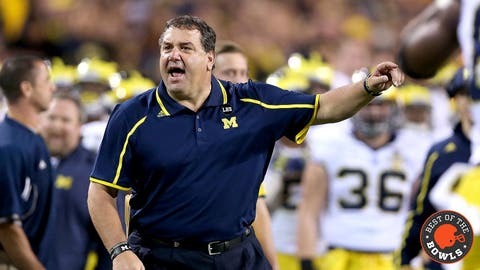 Things started so swell for Brady Hoke in Ann Arbor, Mich. Victories in his first six games as head coach of the Michigan Wolverines, including a win over Notre Dame. A 6-2 record in his first trip through the rugged Big Ten, with one of those six coming against despised Ohio State. And, of course, a Sugar Bowl win against Virginia Tech, which capped an 11-2 debut season for Hoke and set the Wolverines on an upward trajectory, the kind of which they hadn’t seen since Lloyd Carr was delivering Rose Bowl berths (if not Rose Bowl wins) a handful of years prior. That upward Michigan momentum couldn’t have been further removed from Saturday night and the 31-14 loss to Kansas State in the Buffalo Wild Wings Bowl. It put the final ugly finish on a 7-6 (3-5 Big Ten) season for Michigan and accelerated the frustration among Michigan fans after last season — 8-5 record and a loss in the Outback Bowl — was a step back from Hoke’s first. Here are a sampling of tweets from the Michigan crowd in the final moments of the BWW Bowl. See if you can detect a theme. I'm going to bed. This is a straight up dumpster fire. 7-6. This is Michigan fer GODSAKES! @Brandi_Love hopefully you're doing something much better than watching this dumpster fire of a Michigan game. I wouldn’t go quite that far, and a couple things, if only for perspective’s sake, need to be mentioned. Hoke’s worst season, 7-6, is the best the previous coach (Rich Rodriguez, who’s now at Arizona) ever posted in Ann Arbor. That’s not a compliment per se, but rather a little speed bump to slow you down a bit while you’re on your way to firing him. Also, Michigan has two BCS bowl wins in the last 15 years, and one of those belongs to Hoke. Again, just an offer to pause and think for a second. Hoke’s situation is a little similar Will Muschamp’s at Florida in one meaningful way: They both had great success early in their tenures and thus didn’t have the luxury of incremental progress and the goodwill that comes with making tangible strides. Muschamp went 7-6 in his first season (2011) and then 11-2 with a Sugar Bowl appearance last year. This season was an utter disaster at 4-8, one marred by a fluky wave of injuries and an inept offense that led to the firing of offensive coordinator Brent Pease, and now Muschamp finds himself on the hottest of seats entering his fourth season at UF in 2014. The trend is working against him, and now he needs a dramatic shift in one season. Hoke faces the same downward trend. He’s won 26 games in the last three seasons at Michigan with records of 11-2, 8-5 and 7-5, respectively. If those records were flipped or cut up a bit differently — say 6-6, 8-5 and 12-1, respectively — the Michigan administration would be running to sign Hoke to a hefty extension before his name was mixed in with the rampant Texas rumors. An example of the opposite? Charlie Strong. He won 25 games in his first three seasons at Louisville, but went 7-6, 7-6 and 11-2 (which included whipping Florida in the Sugar Bowl). In his fourth season, he’s followed up with a 12-1 campaign and now stands as one of the business’s rising star coaches. It’s always about the trend, and when you win 11 games in your first or second season, there’s very little room for progress. And if you’re not making progress, as we see every season, then you’re on the way out. That seems to be the reality Hoke now faces at Michigan. What will 2014 hold for him? Well, hopefully some better quarterback play. Devin Gardner, out of the bowl game with a foot injury, was granted a medical hardship in March for a back injury in 2010, which will make him a fifth-year senior next season. He completed 60.3 percent of his passes for 2,960 yards and 21 touchdowns (11 interceptions) in 2013, which wasn’t a regression from his 2012 season. He will have to improve in ’14 or will be pushed by rising sophomore Shane Morris, who started the bowl game and went 24 of 38 for 196 yards with an interception (he also added 43 rushing yards on four carries). More than upgrading the passing game, Michigan fans are pleading for defensive improvement after watching Kansas State quarterback Jake Waters shred the Wolverines D on Saturday. He completed 21-of-27 passes for 271 yards (10 yards per attempt) and three TDs. Michigan wasn’t as bad on defense this season as the Buffalo Wild Wings Bowl would lead you to believe — it ranked 34th nationally in yards per play at 5.20 — but it wasn’t good enough, not to compete with Michigan State, Ohio State and Wisconsin. Jabrill Peppers, a five-star two-way recruit, could help some in the secondary next season. (Here Michigan fans: Take a breather and watch Peppers’ 2013 highlight video. Everything will be OK, in time). In 2014, Michigan again avoids Wisconsin and has a generally manageable schedule. Three games stick out: at Notre Dame (Sept. 6), at Michigan State (Oct. 25), at Ohio State (Nov. 29). Winning one of those could put the Wolverines back on the 10-win track and switch the trend that’s currently working against Hoke. One way or another, we’ll all know. If watching Michigan football makes fans want to tweet about dumpster fires and RIPPING THEIR ACL OUT, we can surmise the Buffalo nightmares have not been squelched and all is not well in Ann Arbor.